Last week, the US Census Bureau released 2015 population estimates by city. To nobody’s surprise, Seattle continues to grow rapidly, having added 15,300 more residents in the year ending June 2015. Seattle has grown by 74,000 residents (12.1%) in just five years. Seattle, for the third year in a row, is among the five fastest growing cities in the nation. Seattle, with 684,000 residents last year, is now the 18th largest city, overtaking El Paso and Detroit. Seattle’s growth was 44% of the 34,800 residents added in King County in 2015, or 41% of the 179,400 added in King County since 2010. Among cities larger than 50 thousand population, only Bellevue (+2.4%) and Marysville (+2.5%) grew faster than Seattle (+2.3%) last year. None have grown faster than Seattle over five years. (A few smaller exurban communities have posted higher growth rates). Bellevue added 3,200 residents in 2015, bolstering its role as a major employment center for the Eastside. Tacoma added 3,300. Everett added 1,200. Nine other cities added over 1,000 residents, including Issaquah which saw a 5.8% growth spurt and almost 2,000 new residents. Renton, growing more slowly, nevertheless saw its population exceed 100,000, becoming the sixth city in the region to reach this milestone. Overall, King County grew 1.67% last year. For the second year, Snohomish grew just a little faster (1.72%), boosted by growth in Marysville and in unincorporated areas. Pierce County grew 1.54% last year, with much of that growth in unincorporated exurban communities. While Pierce and Snohomish both lagged coming out of the recession, their growth has now clearly caught up. 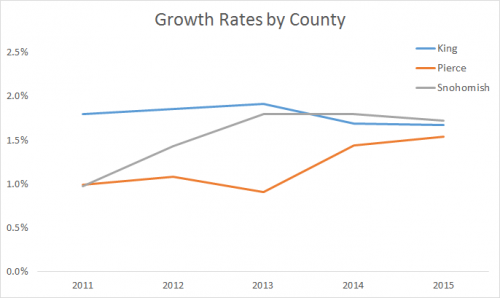 Growth in the three counties has converged since 2013. Seattle dominates the rankings for several reasons. King County growth is relatively centralized, and Seattle has been the major beneficiary of that. The reasons appear to be a mix of market and policy preferences. 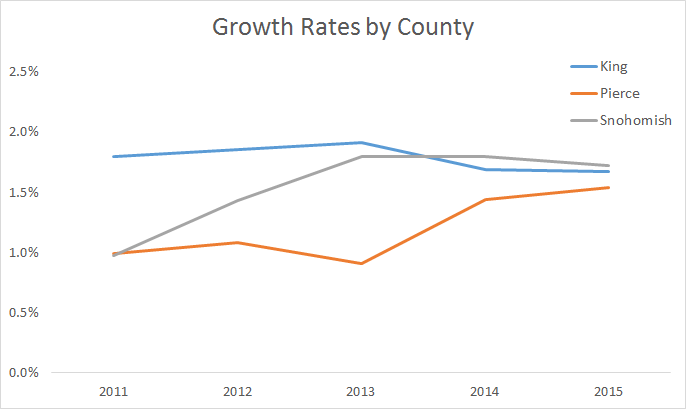 Just 4% of King County’s 2015 growth was in the unincorporated areas, vs 52% for Snohomish County and 41% in Pierce. In both those counties, the largest cities generally grew much more slowly than the County as a whole. Also, Seattle is simply bigger, so that higher growth rates translate to much greater added population. Seattle’s somewhat higher 2015 growth rates translated to as many new residents as the next eight cities. 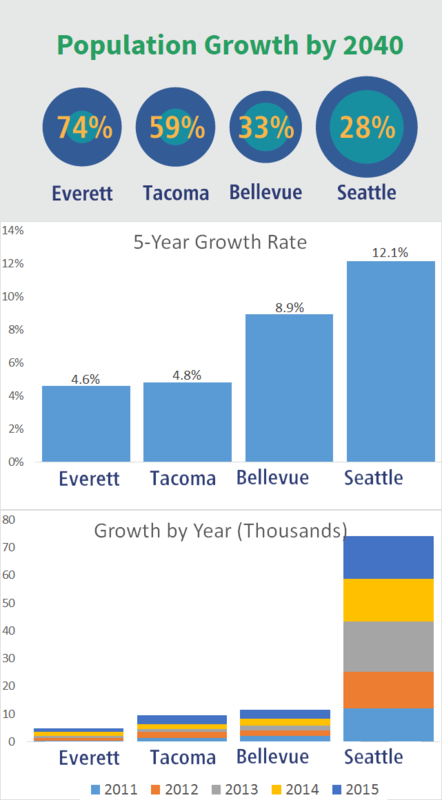 Growth in 2010-2015 for the largest cities, show Seattle and the Eastside leading the way among urban areas. 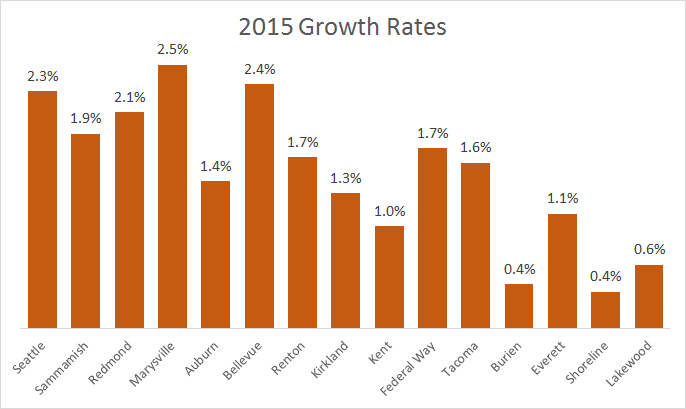 2015 growth accelerated in Marysville, Bellevue, Federal Way and Tacoma. Is it time for STB to publicly call out these “regional growth targets” as complete baloney? Everett is “targeted” to grow 74% by 2040, yet has only grown 4.6% in the past five years. There are less than five more five-year periods between now and 2040. 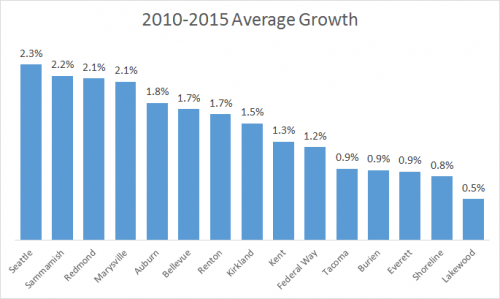 If this growth rate continues, Everett will grow 25% by 2040, not 74%. What data, if any, are they using to predict that the growth rate will increase by so much beyond what we are observing now? Similarly, Seattle has grown 12.1% but is “targeted” for only 28%. What data are they using to predict that growth will slow down in Seattle compared to the recent five-year period? This is important. These targets are used to estimate ridership on new lines, allocate regional funding, etc. We need reality-based targets, not these pie-in-the-sky suburban-sprawl-predicting ones. I think it has something to do with the fact that it’s harder to grow by a certain percentage when you already have a lot of people. For example, for Seattle to grow by 100%, it would have to add almost 684,000 people. But for Everett to grow by 100%, it would only need to add about 100,000 people. This is why it is noted that “A few smaller exurban communities have posted higher growth rates,” because if a town grows from 100 to 200 people, then boom, that’s 100 percent. If the same number of people moved to Seattle, it wouldn’t even register as 0.1%. Yes, that is definitely the case. But that doesn’t change the argument. If anything, it adds to it. Either Everett has reached the saturation point (all the cheap land has been developed) or there simply isn’t enough demand for even the cheap land. My guess is it the first. So now we are comparing two cities, and trying to figure out which will grow in the same manner. Which one will replace their houses with apartments. So far, Seattle is clearly winning, and I see no reason why that would change. “Sprawl-predicting” growth targets would favor development in unincorporated areas. The regional plan instead focuses most in Seattle, Tacoma, Bellevue and Everett, all four urban centers on their own merits and not it any way sprawl. If you’re worried about sprawl, talk about Marysville, Sammammish and Graham. Sure, let’s talk about those places. Unrealistic growth predictions are causing our regional transit agency to prioritize an extremely long train line to Everett and Tacoma, since these places are predicted to have their population go up by 50% or more in the next 25 years, a population increase that would necessitate frequent mass transit connecting them to Seattle. When you build such a line, outfitted with plenty of parking stalls at most of the stations, people will move to places like Marysville, Sammamish, and Graham because they will now be able to commute to Seattle in a predictable amount of time from those places. But what if the growth targets that led to the whole “spine über alles” priority were wrong? What if the existing small urban centers aren’t actually growing fast enough to need a massive expansion of transit? Might some people decide to remain closer to their jobs rather than allowing induced demand to draw them to cheaper housing farther out? What is “enough” growth to need a massive expansion of transit? The spine is based on the premise that Tacoma and Everett already need it for the existing population. And “decide to remain closer to their jobs” is cruel when people are increasingly moving there involuntarily because they can’t afford to live closer in. >> The spine is based on the premise that Tacoma and Everett already need it for the existing population. Really? Wow, that is crazy. Tacoma: http://arcg.is/1WOonjU. Everett: http://arcg.is/1WOoQCp. Oh, and it might not be obvious from that map, but Tacoma and Everett are also a very long way from Seattle (with not much in between, as you can see from that map). Proximity matters. Density matters. Not that many people are willing to spend three hours* commuting back and forth (hour and a half each way) which means that people will, of course, find jobs closer to home (or move). The only way that Link would make sense is if those cities grow like crazy, as do the suburbs in between them. That is highly unlikely (and flies in the face of all the trends) but that is the only way it could work. * Consider a typical commute. From a neighborhood in Tacoma, you take a bus to Link. Fifteen minutes later, you are at the station. An hour and 15 minutes later, you are at your job at South Lake Union. Sorry, there just aren’t that many people who will do that. Ross is right. Tacoma and Everett are much more naturally served by fast, frequent buses initially and eventually even faster though probably less frequent commuter rail lines. The BNSF line is a natural, especially because it picks up Puyallup, Auburn and Kent along the way. Unfortunately, there is no feasible commuter rail route to Everett because of the topography. If there were a good rail route, it would already exist. (Well, some shadow of a rail route did exist in the Interurban, but its approach to Seattle was terrible). I agree. Tacoma would be much better served by Sounder, than by extending Link. Less frequent, but add buses in the middle of the day (that will be plenty fast) to make up for that. Everett doesn’t work as well for that. But Everett is a lot smaller. What passes for density in Everett is located on the southern end, closer to 99. So run express buses there to Lynnwood, in combination with Swift. Swift only runs every 12 minutes, so it is fair to assume that Swift 2 will be the same (http://www.commtrans.org/BusService/Images/Swift-II-Map.jpg). So run similar buses on much the same route, every 12 minutes (alternate those). One run would follow the Swift 2 route, starting at Boeing, and when it crosses the freeway, head south to Lynnwood. Another bus would run down 99, but then turn on 164th and get on the freeway there. Add a few more (similar) express buses, and call it a day. That is a much better value than Link. Even if the state does nothing with the freeways (refusing to change HOV2 to HOV3) in twenty years (which i think is doubtful), you can make up for that by fixing the surface streets (where most of the time will be spent either way). And to address Everett specifically, that city’s growth is extraordinarily hard to forecast, since it is so tied to Boeing’s fortunes. Boeing’s been doing well, but they’ve also shifted a bunch of work to other parts of the country. The PSRC owns these, and they’ve stopped providing forecasts – for the last six years. PSRC is currently conducting an evaluation of the model for this data series, and has not produced estimates since the 2010 Census. If ST and Metro have to use known bad 2010 estimates for growth, no wonder they are overstating the potential ridership in Totem Lake and Issaquah, and understating ridership in Ballard. I think it’s more of a quota rather than predicting spontaneous growth. A million people are coming to the region, so every city has to zone a proportional amount of housing for them, they can’t go “No growth!” and shirk it on the other cities. People choose which city they want to live in to some extent, but they also go where the housing is available. So if the available housing is in Issaquah and Totem Lake, that’s where they will go. What’s happened in this last wave of growth is people have expressed a strong preference for Seattle, not just the expected Center City and U-District and Northgate but also Ballard-Fremont and Lake City, which are not designated urban centers although they should have been. (“But ugh, growth, keep it out of our small-town residential neighborhoods! No Ballard urban center!”) So wealthy people bid up the rent/sale prices to get what they want, and everyone else has to move elsewhere, to Bothell or Issaquah or Lynnwood or somewhere. But the thing is, these quotas aren’t maximums, they’re minimums. Nobody is prohibiting Seattle from building more housing and offices than specified in order to accommodate everybody who wants to live in Seattle, or even 400K (if we assume 1 million is the ceiling for Seattle). But that gets into the city council approving it. The council is having enough trouble just implementing HALA and loosening ADU/duplex restrictions. But that’s what the city could do. Zone for 400K more people and be done with it. Preferably with Vancouver-like highrises around Link stations. The important thing to keep in mind about the regional growth targets is that they reflect policy; they are not “objective” projections. The model forecasting growth is therefore heavily constrained by policy. If you’re wondering about a model unconstrained by policy, PSRC has that too but it isn’t that useful. It has some built-in limitations due to the nature of the model and its inputs and produces “interesting” and not very useful results. How useful are the current results? Assuming funneling Federal Dollars to suburban and exurban locations isn’t an objective. The usefulness of the current results depends on your point of view. As a tool to show how the current regional growth policy is projected to play out, it is quite useful. Whether that policy is smart or not is a different argument which is not directly related to the model. Not all the policy-driven constraints in the model are “bad.” For example, the current regional growth strategy, and hence the model, assumes no change to the urban growth area within the bounds of the model, or by 2040. This puts an effective cap on the amount of land available to accommodate projected growth, resulting by necessity in more high intensity land use over time, especially in the Regional Growth Centers. As a tool to show how the current regional growth policy is projected to play out, it is quite useful. How can projections have been so wildly innacurate in any way be useful? Keep in mind Seattle is quickly consuming much of it’s easily develop-able land, esp in urban centers. The high growth rate is on the back of turning SLU parking lots into 30 story residential towers. Once SLU/Belltown fills out, I would expect the growth rate in Seattle to level off a bit. Unless, of course, we see a SLU-like boom in another neighborhood, like U district or Northgate. Once Seattle & Bellevue build out their cores to their zoning maximums, I would imagine we’ll see the high growth areas shift to other cities with ambitious upzones, like Lynwood & Kent, and eventually Everett, which has plenty of land available for dense development, esp around Everett station. The U-District is growing, and the university’s new long-term plan has a big expansions around Pacific Street, the Montlake parking lots, on campus, and perhaps the north campus dorms when they decide what to do with them. Northgate is a designated urban center, so it’s expected to have midrise towers like the U-District and SLU. It is the opposite. The cheapest land is green field. That is why Sammamish has a very high growth rate. But that will soon be completed, which means that growth there will level off. Seattle, meanwhile, is growing *despite* having very high rents. People are constructing expensive apartments because lots of people want to live there. There is still plenty of land, though, that can be developed, and sits idle (in Rainier Valley, Bitter Lake, Lake City, etc.). These are not the hottest properties, of course, but building there is still a lot more expensive than building in Everett. But the demand simply isn’t there for places like Lynnwood and Kent. If people are willing to rent out apodments (enough of them for the city to ban the things) then there is obviously pent up demand that will soon spillover into nearby neighborhoods. Even without a change in zoning (which will likely happen) Seattle will continue to grow faster (in absolute number) than the surrounding areas. Unless, of course, we see a fundamental change in demand (such as Kent apartments renting for more than Seattle apartments). I really doubt that will happen. RossB – you have to keep in mind the Urban Growth Boundary. While yes there are still a decent amount of greenfield development space available is Sammamish, Issaquah, etc. I think that space will be gone soon (<10 day), and then as long as King County holds firm on the UGB, all the growth will be channeled toward redevelopment. At that point, I would expect areas like Rainier Valley and Bitter Lake start to get build up b/c there will simply be nowhere else for capital (let alone people) to go in King County. As for the demand side of things, I think the Northgate & Lynwood Link will be game changers for the desirability of those neighborhoods, along with the Bel-Red corridor once East Link opens. Rent will spike, and (re)development will follow. Trickier is someplace like Kent, which is keen to develop around the Link stations, but it's unclear to me how ambitious they are with density around the Sounder station … clear opportunity to develop mid-rise anchored by the Sounder station, but might not be a political appetite for that sort of development. Probably, Seattle will still continue to grow the most in absolute terms. It's simply a bigger city, and the upzones in other cities aren't simply big enough to absorb the growth Seattle can in it's urban centers alone. But if Seattle gets restrictive on zoning (i.e. HALA fails), I could see the gap close between Seattle and it's suburbs in terms of % of King County population. AJ and RossB are both right because the answer changes depending on which timeline you look at. In the short term Seattle will keep growing at a high level because of the number of people who want to live in the city, can afford it, and will pay high rates to do so. That’s Dan’s 44%. But eventually Seattle will fill up to whatever the multifamily zoning limit is. (Not single-family because all the SF lots already have houses on them.) Even before it reaches 99% full, developers will have difficulty finding large enough lots for bigger projects, which some developers prefer. Those will be the first to start spreading out into the suburbs. The urban growth boundary will not be extended (hopefully) because funneling growth to the unrealized urban centers or other municipal forms is precisely what the boundary was intended to do. Seattle could do something unexpected like converting all single-family areas to lowrise, or my favorite example of allowing 3-10 stories everywhere between 24th NW, 15th NE, the Ship Canal, and 65th or 85th. That would create a large urban village like Chicago’s north side. That could everybody who wants to live in Seattle and then some. The suburbs might be so grateful at Seattle taking growth off their hands that they could help fund the infrastructure. But these are fantasies. The city council wouldn’t allow it, and many suburbs realize they need to have urban centers in order to attract companies and investment, so they won’t want to give all the prosperity to Seattle. I agree, AJ, eventually the green field development ends (as areas are locked out). But I don’t think that is holding back places like Bitter Lake. Seattle’s growth is 44% of the entire county. That is amazing, considering the relative size. Growth is happening like crazy in Seattle, and it isn’t happening in a green field manner, it is just not happening (that much) in Bitter Lake and Rainier Beach. To be clear, I think those areas will eventually pick up steam, but what is holding them back is not green field development in the suburbs, but more desirable growth elsewhere in the city. Northgate is growing, so I don’t see a huge spike there. In general, the effect that transit has on these areas is minimal. Ballard is growing like crazy, and has terrible transit problems. Rainier Beach is not, but has great transit (with not only Link, but the highly popular and frequent 7 serving it). Link won’t change things, but changes in zoning could. Even minor changes (like the proposed changes to ADU laws) could add a lot more units. Even without much of a change — with just the the normal urban village plans — there will be huge growth. The trend is obvious. Both businesses and people want to live in the city, and the zoning laws are slowly changing as a result. I would be very surprised if anything changes in the future (Seattle will continue to lead the region in growth). Even if the urban growth boundary expands, there is a limit to how far people will life from where they work. Eventually, they find other jobs or move. Fox Island, areas along Hood Canal and a few other places have quite a number of lots for sale, but the number of people willing to travel that far to get to work is limited, so the lots remain for sale for long periods. Eventually, increased density has to happen. And they will move here from places that are much worse than Seattle and feel blessed. Livability will be determined by whether we follow the curve, or stay ahead of it. I don’t believe that you just ‘add’ percentages to come to 25%. you have to compare start year to finish year. When they report these interim numbers remember that you grow 5% on a larger base every time. Yes, I know percentages are multiplicative. 1.046 ^ 5 = 1.252. Just like I said, 25% growth over the next 25 years if the previous five-year trend continues. “…overtaking … Detroit.” I think this is probably more a sign of how bad Detroit is doing than how good Seattle is doing. It’s both. After all, Seattle just beat El Paso, which is hardly a declining steel town. It appears that Detroit’s population is actually getting close to stable. The losses are considerably lower than just a couple years ago. From week’s visit a few weeks back to Detroit and its suburbs, both places I used to live, this is perfectly reasonable. Reasons to either stay in Detroit or move in are now more than counterbalancing the reasons to leave. A lot of young people of many different incomes and motivations see opportunities. And Detroit has always had people who aren’t going to live the homes and lives they built there, period. Interesting thing to me: With the climate of the Bay Area or Seattle, the place would be South Lake Union to the horizon. But Detroit is just too big and uncomfortable to privately gentrify without massive Federal help. But along with Oakland and some other BART stops, Detroit is a good bet for an economy of the kind of small-scale design and manufacture on which I think this country’s life depends. Detroit already tried the other kind. My last night in Detroit, heard radio interview with a billionaire loan company CEO who’s bought 80 buildings in Downtown Detroit. Though he’s having a hard time convincing other suburban CEO’s to come help him. He’s also building a streetcar line a few miles up Woodward Avenue, the old central artery. Tracks already laid. If either Detroit or his loan business take another hit, worst is that we’ll have source of affordable equipment for our own expansions. A lot depends on how you measure it as well. The past few years, Detroit proper shrank considerably, but the suburbs grew. Overall, the shrinking was minimal (which is typically the case, cities don’t shrink that fast). Now, it looks like the city itself isn’t shrinking that much. Remember, Seattle was once a shrinking city. Detroit will stop shrinking at some point and turn into a new kind of city. Seattle is no longer swayed by the fortunes of Boeing. Questions. How many of these people moved here, and how many were born here? Of first group, why did they move here? How many people found better work here than where they moved from, how many no change, and how many worse or none? Why were things worse where they came from? Both curious and uneasy about how many people are in motion now, less from moving in than from suddenly and massively being essentially forced to move out of long-time homes. Due to prices increases having zero to do with added value, and the rest with pure speculation. Moving into the question of how much value (what something’s worth for its use or benefit) as opposed to price, meaning what someone’s willing to pay for it at a given second? When I asked him about worst problem DSTT security was facing, one word from young DSTT security guard: “Homeless”. Meaning to him really people who need the residential medical care that could save still-taxpaying passengers a lot of discomfort and danger. But very tired of the passing remarks on TV and certain other comment-spaces about how we’re seeing more homeless people than ever. Delivered as if being a still-working husband and wife lucky to have a beaten up recreational vehicle to keep their kids in means they don’t deserve the vehicle. In the 2008 crash a lot of newcomers moved back where they came from, so much that Summit had a “For Rent” sign on practically every building for 10×4 blocks. People who loved the northwest stayed in spite of it, people who didn’t left. The next crash may be different, and things are tighter now than they were then (so the same number of people leaving would make less of a difference, and some of e.g., SLU’s/Capitol Hill’s growth is probably permanent), but if the past is anything to go by, something like that would happen again, and that tells how deeply rooted people are to this area. It’s about 38% locals, 62% transplants, last time I looked at the data. It should be noted that the Marysville growth is simultaneously sprawl and dense as its likely coming from several large apartment buildings in what was previously forest land and farm land. Its not exactly the kind of growth we want to see more of. I’d rather see a major redevelopment of downtown Everett (an order of magnitude more than what they are currently seeing) than another subdivision built so far north it takes residents over an hour and a half to drive to their jobs in good traffic. So why didn’t it happen in Everett, and are Everett’s current growth plans any more reliable? There are two potential factors and I don’t know which is bigger. One, Everett didn’t get its act together and zone for growth soon enough so it missed the wave, or Everett is especially undesirable (it does have a slum reputation to some), or its regulation/taxes were too onerous. Two, the county had so little regulation in unicorporated areas that developers flocked to it to avoid oversight. There are some apartments being built in Everett, but its still only a handful of projects. Its not clear what the issue is yet, though the lack of high paying jobs in Everett doesn’t help. The light rail might help, but that’s not particularly clear. Its a lot cheaper to clear out more farmland, further north along I-5 and build more housing, so on price alone Everett can’t win against developing more farmland. My guess is Everett needs more downtown style amenities and a more active streetscape to attract folks at the price point they need to really start big, new developments. Prioritizing Pane Field over downtown Everett probably isn’t helping. Infilling Everett between downtown and the station can’t be that much more expensive than greenfield development, especially with the city begging for jobs and investment. Everett has tried multiple times in the past forty years to revitalize its downtown and they all failed. And it’s not like Marysville has more jobs than Everett, so people can’t be going to Marysville for the jobs. No, I don’t think huge numbers of people are going to Marysville for jobs. It may be retirees. While infilling isn’t that expensive, greenfield development is still cheaper, and in many cases, more desirable. If you saved your money all your life, and just want a nice plot of land not too far from the city, then Marysville is probably a better bet. We aren’t talking about huge numbers of people, either. About 6,000 over five years (on 20 square miles of land). Living next to the new apartments and their generous share of parking spaces, it makes me sad. I had a front-row seat to the felling of decades-old evergreens to make way for a sporting goods store as well. The city is currently developing a neighborhood plan that aims to turn even more farmland between the tracks/schools and I-5 into an urban center of sorts centered around the railroad but without a train station. One can only hope that the old Downtown Master Plan is implemented someday. Mixed-use midrises replacing the downtown mall would be a huge improvement. Maybe it can be done in time for Swift and Sounder at the tail end of the decade. If Marysville residents are angry now about how well their many at-grade rail crossings work for making traffic hellish, wait until they build even more low density, auto based town centers around even more at-grade rail crossings. On another note, I hope to see Lynnwood on this list in the next year or two. They are at least building some new apartments near where the station is going to be built. It’d be a hopeful sign of the future of the main line if we could see a 5-10% bump by the time 2023 rolls around. Might not be here for a few more years, but as long as the economy keeps chugging along, Lynwood is going to have a boom right around the Link stations opening. It remains to be seen if a boom will come for Lynnwood in this cycle or in a future one. “exurban” Adj. a polite way of saying auto-dependent sprawl. Exurban is the growth beyond the 1990 suburban ring, so between twenty and forty miles from downtown Seattle more or less. The 1990 ring was Lynnwood – Bothell (not Canyon Park) – Woodinville – Redmond – Renton – Kent – Des Moines. Auburn-Tacoma was mostly a separate job market, as was Everett, except for Boeing workers who have always had long commutes (especially when Boeing transfers them between plants willy-nilly). Exurbs also tend to be unincorporated and to be missing some features of a city (e.g., no town center, just a “power center” of big-box stores and gas stations). But now Marysville has grown so much that it’s arguably a regular suburb now, and of course many of them don’t work in Seattle but in Everett or Lynnwood so to that extent it’s a suburb of them. Highway 9 is perhaps the epitome of exurban. But you don’t have to go that far for car-dependent sprawl. I walked the Soos Creek Trail once and ended up at its northern end, SE 192nd Street & 124th Ave SE in northeast Kent. Walking from there to the 169 (108th Ave NE) was depressing and felt like a southern California nightmare. Large streets, cul-de-sacs with one entrance, and forget about a bus. But it was built up in the 1970s, not the 1990s or 2000s, and it’s and it’s only ten miles from downtown. I did notice that some residents had punched a hole in their fence so the kids could walk straight through without having to go all the way around to the entrance road. So that’s a glimmer of progress. That “sprawl” is what keep housing costs down and allow all sorts of different types of people to own their homes much like the white Loyal Heights settlers in the 50s who drove 8 MPG Plymouths everywhere (which are banned now that the valuable land near the water is all taken and permanently one story). I’ll take the sprawl and the opportunity if offers over Seattle’s blatant exclusivity any day. Sprawl isn’t financially or environmentally sustainable. We need to allow more housing to be built closer in so commutes are shorter and more folks who want to live rather than having to pick a place over 90 minutes away by car because that’s all that is affordable. Present sprawl explosion is largely driven by forces trying to densify. What these pages have been advocating since STB opened. Since we’re going to get blamed anyhow, what do us transit advocates do get this situation under control? What opportunities are you going to have, Gregg, when the amount of cars which sprawl needs for transportation won’t let you get out of your driveway? This living pattern made sense right after World War II, when a lot of young families got a car for first time in history for their income bracket. The cities really were old and overcrowded. But mainly, nobody ever thought that a land with so much room could ever get full. After about four decades of proof, why do you think keeping up this way of living is going to give you anything you can stand, let alone choose? Resenting exclusivity, I’m with you. Starting with excluding most working people from any real choice of anything by paying them terrible wages. Also with the idea that results of minute to minute trading can’t be held to account for their real-world results. Or- any ideas of yours that get you what you want, let alone anybody else. Sprawl as cure for exclusivity? Civil War doctors thought infections helped cure wounds. (Germs were for French sissies who had to wash their hands all the time. The CD, Mt Baker, White Center, and N 80th Street were all the same kind of suburban development back in the day. But those areas have 500-1000 sq ft bungalows on small lots, not 2000 sq ft ranch houses on large lots with two-car garages. This means that by land and utilities alone they cost twice as much to maintain and have twice the impact on the environment, and the government had to spend twice as much to extend utilities to it. The low cost of land obscures this, and people aren’t used to recognizing or quantifying externalities and public subsidies, but that’s what it is. SE 192nd Street could have built bungalows on small lots with a small street grid, and it would still have been affordable housing in the 1970s and everyone would have their own yard. I second Mike Orr. My sister recently moved from cap hill to greenwood, to have enough space to start a family. Obviously Greenwood isn’t all that affordable, but that’s because of location – there’s nothing that says you have to build ginormous houses on ginormous streets, each ending in a cul-de-sac, and then put businesses behind acres of parking, for it to be affordable. More to the point, it’s not that we (speaking for myself of course) are hellbent on banning development in the distant suburbs to force people to spend more money to live in an urban area. It’s that we (speaking for myself) find it totally absurd that we ban most dense development in urban areas, forcing people to live out in car-dependent wastelands because walkable neighborhoods in the city are so rare compared to demand that vast numbers are priced out of them. Do they release more detailed maps of population density or change in population, or is that only for the decadal census? I’d be very curious to see how much of the growth is redevelopment vs. new development, how much denser growth is infill of historic areas of density vs. brownfield vs. greenfield, how much is single family vs. townhouse/rowhous vs lowrise vs highrise, etc. Growth of Seattle and Bellevue vs. Issaquah, Marysville, and unincorporated Pierce County is really just a (mediocre) proxy for the core question: are we building dense, walkable places, or low-density sprawl? I’d be pretty excited if Lynnwood posted big numbers by building mixed use development next to the light rail station, but these numbers don’t do a great job of showing that kind of growth as urban growth (which it is). We know what’s in the future urban centers now: Totem Lake, the Spring District, Issaquah, and Lynnwood are all brownfield sites: either decaying industrial or decaying commercial. Going down to the smaller things, northwest Tukwila, Southcenter, downtown Kent, and highway 99 Kent are all brownfield, as are downtown Burien and Renton for whatever they build. The greenfield developments are largely outside the ST district: Marysville, Maple Valley, the Black Diamond new urbanist thing if it goes through. Thanks for the perspective, Mike. That’s pretty much what I assume, as an STB reader – but I spend so little time in Marysville that I don’t know if they’re building apartments or just SFH, or if there is room left in Kent to build new units without going to apts. Lynnwood has already zoned downtown to be Bellevue’s little brother, and it has also zoned urban villages around Swift stations. Now it’s waiting for developers. I left Lynnwood off of the posted charts because it didn’t meet the 50K threshold (Lynnwood has 37K residents). The recent numbers are very weak – 0.8% growth in 2015, 3.0% total growth since 2010. Some have already arrived (at least near 196th and I-5). The question is how many more will join them by the time 2023 rolls around. It may take another cycle or two before Lynnwood sees a substantial boom. Having cities like Sammamish, but not Lynnwood on the list just reinforces my point made below. City boundaries are often arbitrary. A combined Lynnwood/Edmonds is about the same (physical) size as Sammamish, but contains significantly more people (about 50% more). The growth rate (or lack thereof) is very interesting, though. Lynnwood was late in the game; it upzoned too late to catch the 2000s real-estate boom. Re Sammamish, low-density development by definition leads to a low population, so it will fill up and not have many people and thus not much clout. Bellevue and Redmond and Kirkland and Issaquah are driving the Eastside’s agenda, not Sammamish. We’re currently in a real estate boom, and Lynnwood’s zoning is unutilized; I think Lynnwood is going to require the 30 min reliable to downtown commute that Link will provide, and a real estate boom. I’m really curious to see how redevelopment does or does not happen in big brownfield sites like Lynnwood’s. They’ve got a threshold or chicken and egg problem, as I see it. It’s a bad idea to build walkable-type development there if you’re a small developer, as there won’t be anything else to walk to. Hard to make your money back. But if you can afford to build enough at one time that your residents will have businesses to visit, and that your business tenants will have customers to visit them, the current price of real estate is a steal (see: Vulcan with SLU, or Wright Runstad with the Spring District for the business plan). I’d bet that in the first or second real estate boom after Link is open, Lynnwood will start to see its zoning utilized. It will be interesting to see which is first: Lynnwood that’s zoned for lots of growth, Shoreline that’s a bit closer and zoned more in the 3-6 story range, or Northgate that’s in the city but already has reasonably profitable businesses in the area. There’s an additional time penalty in the south, because Link will follow I-5 instead of 99. No one will be able to walk to the station south of Angle Lake. It seems that most of the growth here is suburban infill on the hills. Lea Hill, Lakeland Hills, and West Hill have been covered in small 10-30 house developments for the past couple of years. (There are a like 2 mega projects still left) To my eyes it looks like there is another 3-5 years of this pattern before all the easy land is turned into 4bd houses. That being said downtown Auburn is ripe for redevelopment, I think as sounder expands it’s span of service Auburn could become a pressure release valve for the value commuter. Rent in the new building is ~1300 for a 2bd IIRC. While older 2bd can be had for under or around 1000. There are hundreds of units of residential currently in permitting and development in and near downtown Auburn. Close to 600 units planned in just one project at 14th NE and A St, near the transit center. This is interesting data, but some of the charts are misleading. Seattle and Sammamish appear on the same chart (right next to each other, at that). The problem is in focusing on growth rates, not absolute number. The first chart does a pretty good job with that, but doesn’t include the other cities. But even that can be a bit misleading, because some cities are simply physically bigger. Seattle is one of those cities. So listing absolute growth per square mile would give a very good measure of what is happening around here. That would measure increase in density, which is essential for looking at things like transit (the focus of this blog, after all). My guess is that Seattle would lead, by a pretty big margin, but Bellevue would be pretty high as well. I am curious as to how other cities (Lynnwood, Edmonds, etc.) as well as unincorporated areas rank in that regard. Is growth still focused on sprawl, or is it eclipsed by increased urbanization? Of course, the ideal would be a chart showing current density, as well as increased density. I think that would show that what happened to Bellevue back in the day was an anomaly, and likely not to happen again. Both businesses are people are moving to the big city. Another question, EHS. How many long-time Seattle residents from places like Ballard have been suddenly forced to move to more sprawled and car-dependent places because wealthier people have decided they’d rather densify? But there’s an even unhealthier aspect. How many older complexes like the one I lived in were bought not by landlords but speculators? People and corporations who buy property, raise rents, and then sell lit as soon as price goes up? I think term is “flipping.” Putting the property into the hands of similar people, who do the same thing. With flip-time headed for terminal velocity. With results that actual tenants and residents more and more frequently have to move, because price increases completely divorced from any added value. And doing nothing but damage to everything the process touches. Can anybody see any reason why the Crash of 2008 wasn’t just Half-Time?